The Minx and I were invited to a media dinner at RA Sushi in the Harbor East area to sample some new menu offerings, some of which had a tropical flair. We started off with drinks, which seem to be a real specialty for the restaurant. 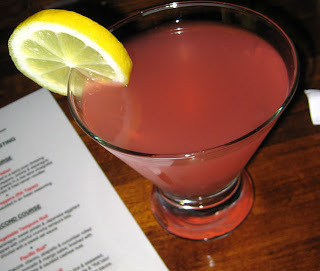 The Minx tried the Red Lotus, a martini consisting of Absolut Ruby Red vodka, X-Rated liqueur, and pink grapefruit. The sweet grapefruit flavor really came through and was quite refreshing. 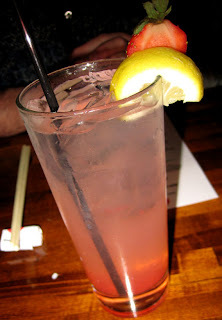 My drink of choice was the Dragon Bite: Bacardi Dragonberry, strawberry puree, fresh lemon juice, Japanese yuzu, and a splash of soda. This could be a dangerous drink if you didn't watch yourself because the alcohol flavor is almost nonexistent. Rather, it's like a flavored sparkling water. I could have imbibed several of these, not thinking about the alcohol content until I had to stand up. 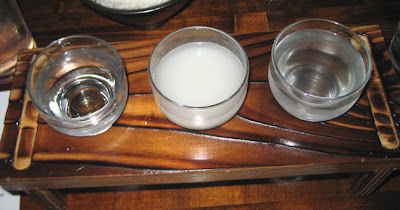 Later on, the Minx and I tried the Sake Flight, three 2 oz. pours of sake: the Kizkura "Pure" is a sake much like what you would typically expect; the Sho Chiku Bai Nigor "Creme de Sake" is a cloudy, unfiltered concoction that was pleasantly sweet; and the Kizakura "Pure" Stars had a slight effervescence and a pleasant, almost citrusy, tang. 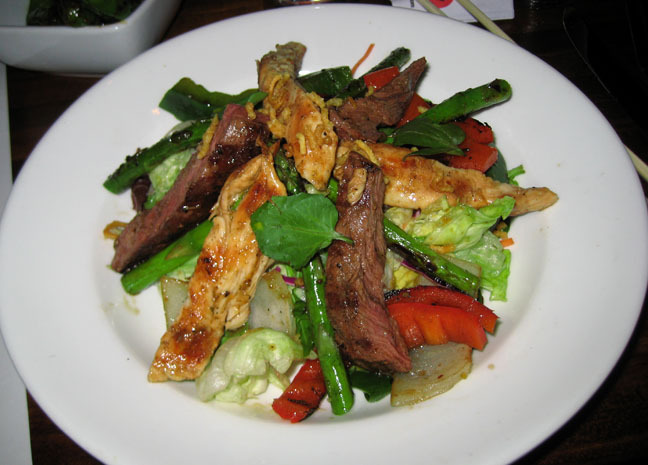 We did do some eating as well, starting with the Otoko Salad, which featured grilled red and green bell peppers, onions, and asparagus over mixed greens in a yuzu vinaigrette. 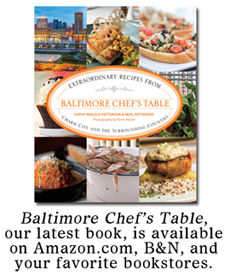 The menu offers the option of ordering the salad with either grilled chicken or beef tossed in a spicy yuzu dressing and topped with fried ramen noodles. Our sampler version had strips of chicken and beef for comparison. Personally, I favored the beef. 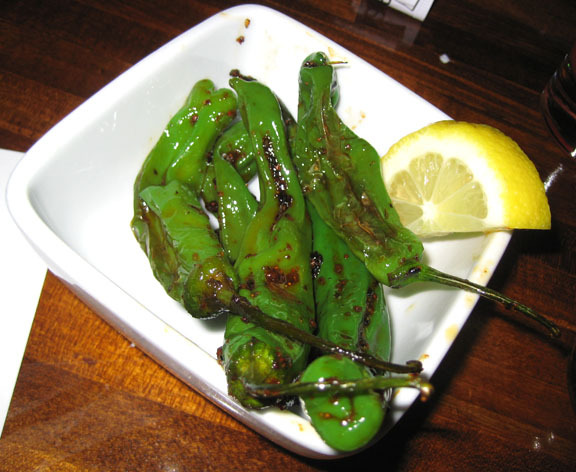 A real surprise was the Shishito peppers from the RA tapas menu. They are a bit like jalapenos, but not as hot (not to say they are not hot - they are). I expected them to taste sweet or spicy or maybe a little of both but the garlicky Asian seasoning brought an added savoriness that balanced out the whole dish, especially with a squeeze of lemon juice. Quite satisfying for something as simple as a bowl of peppers. Our second course was a sampler of new sushi rolls. The Vegetable Tempura Roll consisted of lightly battered asparagus, sweet potato, and Japanese eggplant rolled and topped with colorful crunchy tempura bits. The roll is then drizzled with a sweet eel sauce. A little too sweet for my palate, but pretty substantial for a vegetarian dish. In keeping with the tropical theme, the Pacific Roll was a spicy mix of albacore, cilantro, jalapeno and cucumber rolled in an avocado strip and topped with mango salsa. Red beet tempura bits and sauteed cashew nuts are sprinkled over top. Bright and refreshing, I could definitely see myself enjoying this roll on a hot summer day. "RA"ckin' Roll features the restaurant's "RA"ckin' shrimp (which is on the starters menu and can be ordered as a separate dish). For the roll, kani kama crab and cream cheese are rolled in rice and seaweed, lightly tempura battered and topped with guacamole and the aforementioned shrimp. If that wasn't enough, it's finished with a creamy ginger teriyaki dipping sauce, red beet tempura, and togarashi. A somewhat cumbersome bite, but my favorite of the four rolls, with flavors that were the most balanced and complex. Finally, the Tropical Roll was cucumber, mango, and avocado, rolled and topped with spinach tempura bits and spicy shrimp mixed with masago, and a side of mango salsa. Our third course, Lobster with Garlic Sugar Snap Peas, came from the entrée part of the menu. 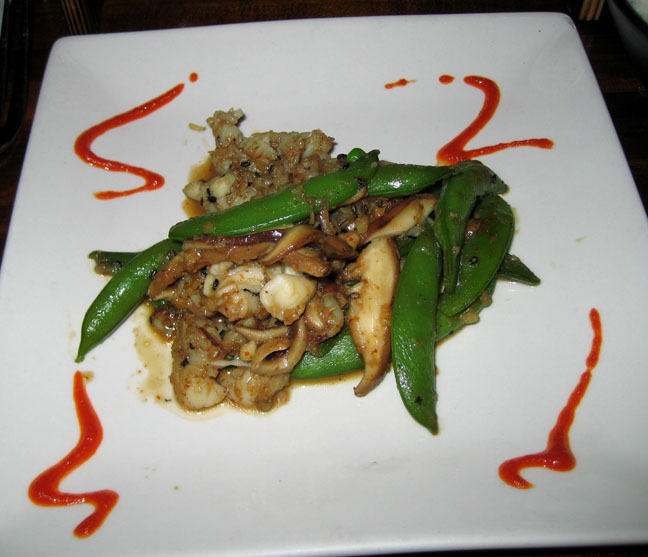 Tender, perfectly-cooked lobster was sautéed in a garlicky sauce and complimented by sugar snap peas and shiitake mushrooms. Our server told us that our sampler portion was about one third the size of the regular portion, which means its a darn good value at $17.50. A bowl of steamed rice was served with the dish, which I gobbled up since I am a bit of a starch addict. 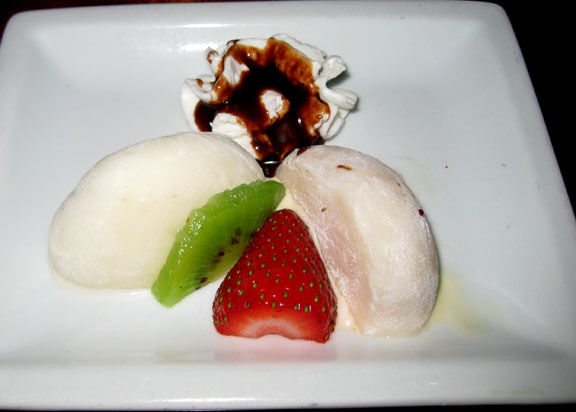 From the dessert menu, we had a Sweet Mochi Trio. Mochi is a Japanese sweet made from glutinous rice and traditionally eaten at the New Year. At RA, the dessert consisted of ice cream wrapped in a veneer of mochi, offering an interesting chewy + creamy texture combo. The menu version contains three different mochi - mango, strawberry, and vanilla - garnished with sliced kiwi, strawberries, and whipped cream drizzled with chocolate sauce. Our sampler only had the mango and vanilla mochi, but both were tasty, and a pleasant, not-too-sweet conclusion to the meal. RA Sushi bills itself as "Sushi-Bar-Restaurant," and I think that's key. While maybe not a go-to destination for serious sushi connoisseurs, RA provides a fun and lively atmosphere in which to enjoy a range of very good cocktails, interesting sake, and a diverse selection of sushi and other Japanese-style offerings to suit a wide range of palates. Don't miss the Happy Hour! 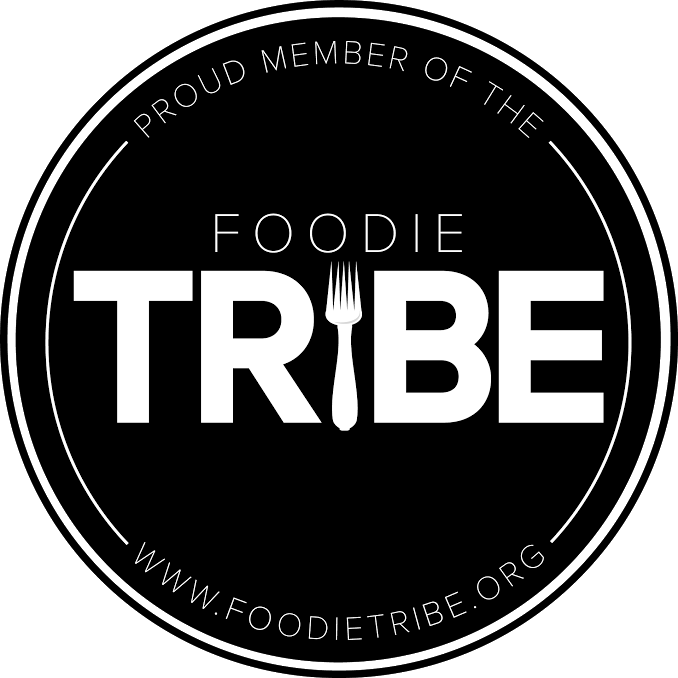 The nerve of you, posting on how YOU liked the food at a local restaurant, on YOUR OWN blog. Sheesh.